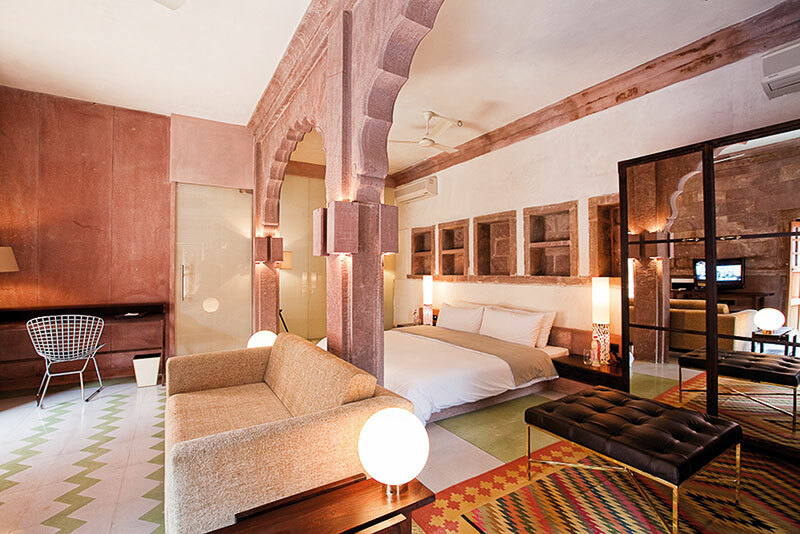 Nestled in the heart of the Blue City, Raas, Jodhpur’s first boutique hotel is an example of the harmonious blending of local elements with modern design. It sits in the shadow of the historic Mehrangarh Fort and almost every room in the hotel offers views of the imposing structure. Built around an 18th-century haveli, the property includes four heritage buildings and three newer ones. Remnants of Rajput architecture can be seen in the jali panels, stone carvings (a specialty of the region), and arches, while the use of space and light are distinctly modern. Blue juxtaposed against red sandstone too pay homage to the region. 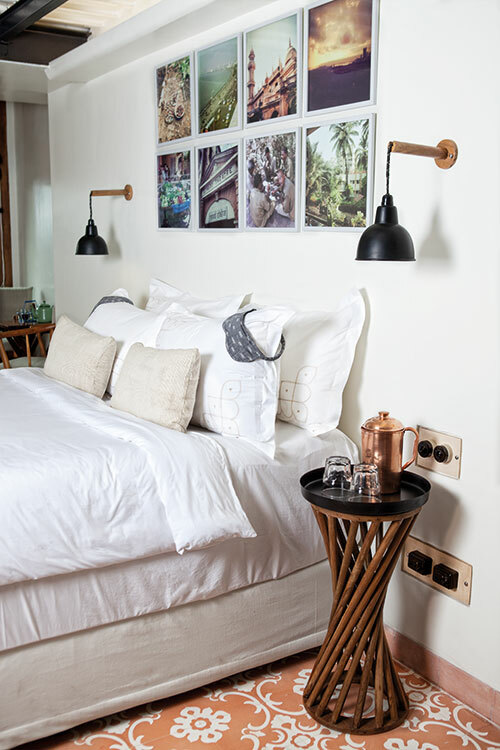 Designed by Studio Lotus, the hotel abounds with thoughtful, luxurious details. The property includes an Ila Spa, a heated swimming pool and a Gem Palace shop apart from two dining areas. The restaurant Baradari is set in a pavilion with 12 pillars — the name literally means 12 pillars. 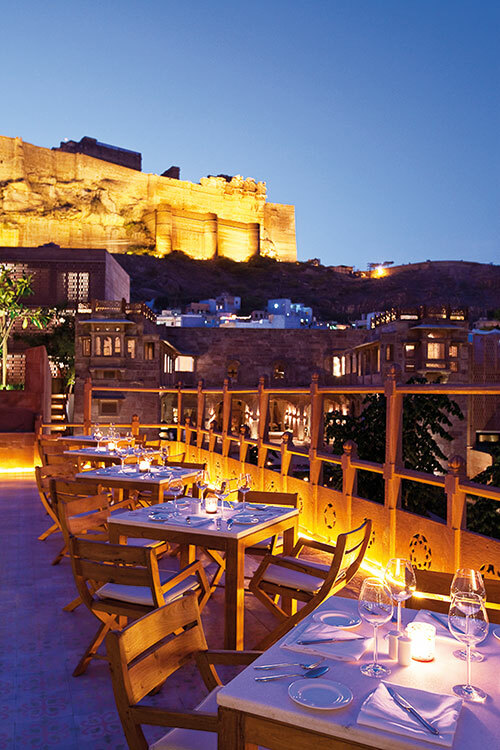 Darikhana, the first-floor restaurant, offers even better views of the fort. Both venues serve world-class food spanning multiple cuisines, besides delicious local fare and all vegetables and herbs are organic and freshly picked from their own chef’s garden. The understated luxury, warm hospitality and sleek interiors of Raas make it so much more than just another heritage hotel. Royal Soiree Plan a candlelit dinner or tea party with a lavish spread under a twinkling winter sky. The property is used to hosting intimate royal gatherings, and their lawn with a view of the lit-up fort on one hand and the hotel’s historic courtyard on the other is the perfect venue for it. Tucked away on the first floor of a heritage building from 1910 in South Mumbai, Abode is a hidden gem. Its location entwines it to the history of the city — it was once the residence of David Sassoon, the leader of the Jewish community in 19th-century Mumbai and one of the city’s most renowned entrepreneurs. The hotel’s design elements are a nod to the commercial capital’s industrial as well as bohemian past. Guests are welcomed by a stunning 19th-century chandelier that dominates the lobby. The flooring is made up of handmade cement tiles produced by Bharat Tiles, whose creations have paved many city landmarks. 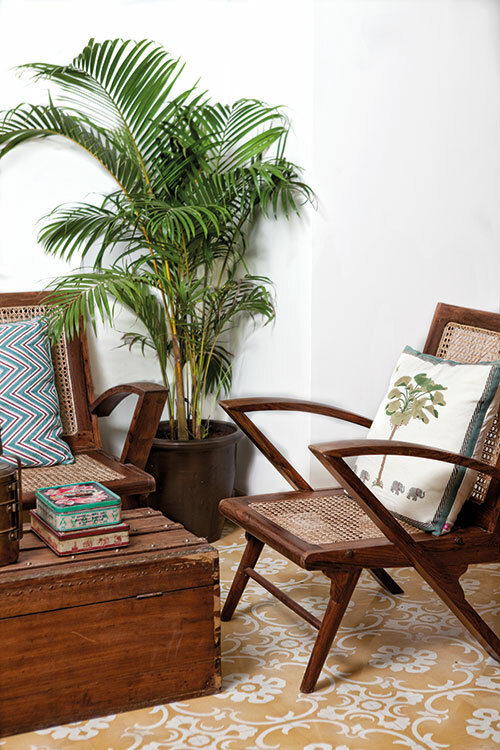 Restored furniture in the art deco and colonial styles, sourced from local second-hand markets including Chor Bazaar, is paired with pieces especially designed for the hotel. Original artwork decorates all the rooms. 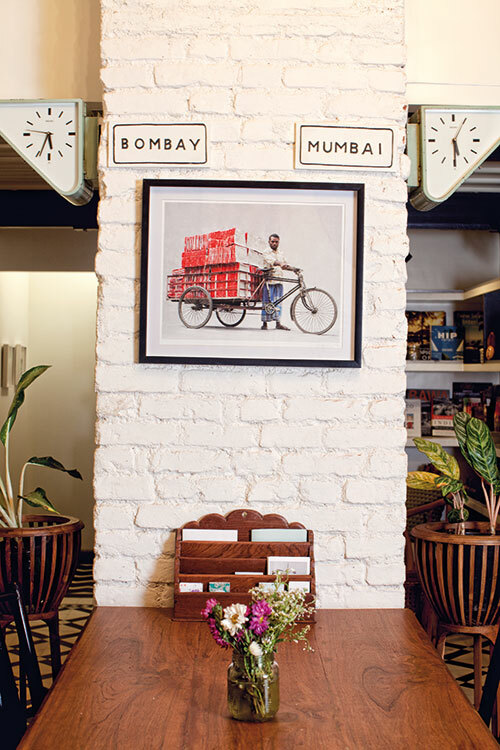 The spaces are peppered with typically Mumbai elements that blend so well with the surroundings that one might not even notice them. “It was about finding what was beautiful about the city and collecting it all together; discovering objects that people overlook because they become a part of everyday life. An outsider can see something new in the ordinary. It’s just the way I work — mixing old pieces with a clean and modern aesthetic,” says Sian Pascale, Abode’s Australian architect and designer. What makes this hotel uniquely charming is that it resembles the well-curated home of a traveller, peppered with casually strewn curios. Examples of these include chaat stands converted into side tables and library shelves that resemble the Fort area’s roadside bookstores. The soft furnishings include repurposed vintage saris, and fabrics woven by the NGO, Women Weave. 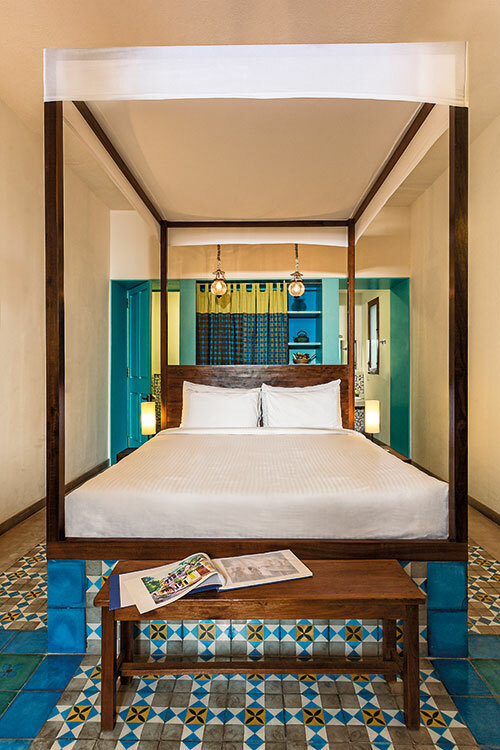 The biggest luxury that the rooms of Abode offer is space, a true rarity in any part of this bustling city, with large double windows letting in plenty of sunlight as well as the history of Colaba. Eco Agenda It is the perfect pit stop for the environmentally conscious traveller. Everything is responsibly sourced and supports local artisans. Working with NGOs in the city, the hotel sells their products in its shop. Their toiletries are kept in re-fillable bottles in efforts to reduce their plastic usage to a minimum. The cafe’s menu too incorporates seasonal ingredients. 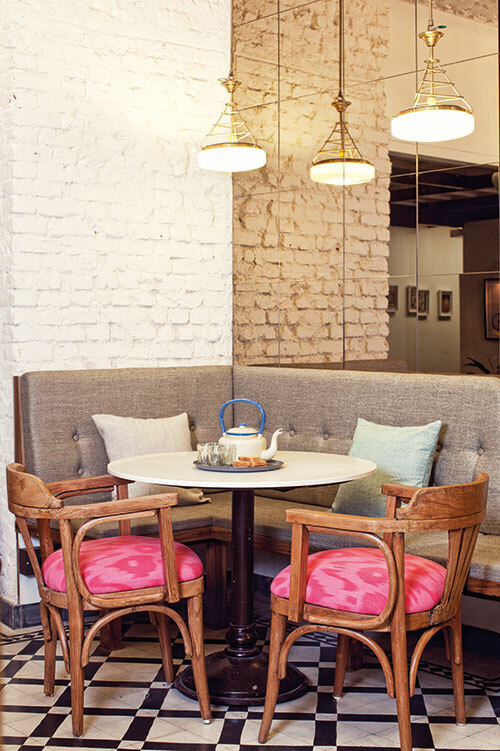 What started out as jewellery designer Munnu Kasliwal’s haven to host his clients and buyers from around the world was converted into one of Jaipur’s chicest guest houses by his son Siddharth Kasliwal. The interiors have been designed by his friend, the Lebanese designer Nur Kaoukji, while the place was built by French architect Georges Floret. The property is co-run by Abhishek Honawar, a hospitality veteran with restaurants in Mumbai and New York, so you can rest assured that their farm fresh, vegetarian menu will be top-notch. “Munnu Kasliwal’s taste for simplicity and his sense of humour were my inspiration,” says Kaoukji. In a homage to his aesthetic, contemporary light fixtures stand beside earthenware pots and brightly painted murals offset otherwise neutral spaces, displaying a harmonious blend of the city’s ancient crafts and understated modernity. Sun-kissed terraces and rooms flooded with natural light are complemented by Kaoukji’s laidback but luxurious furnishings. 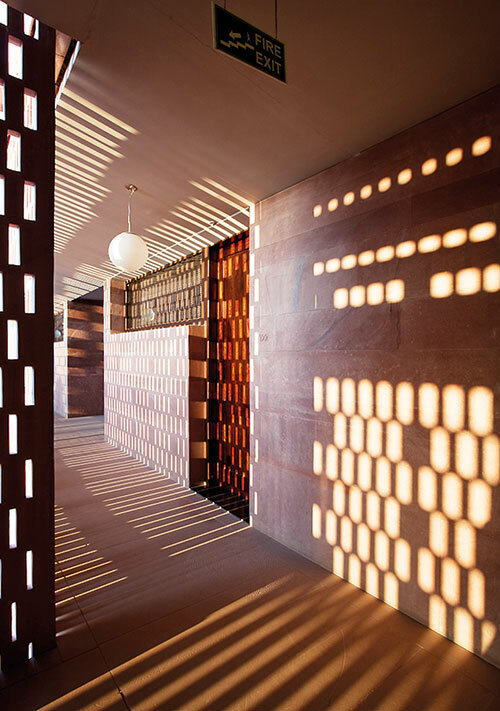 What adds to the airiness of the property are the jali-style windows, carved in stone, casting beautiful patterns everywhere, from corridors to bathrooms. 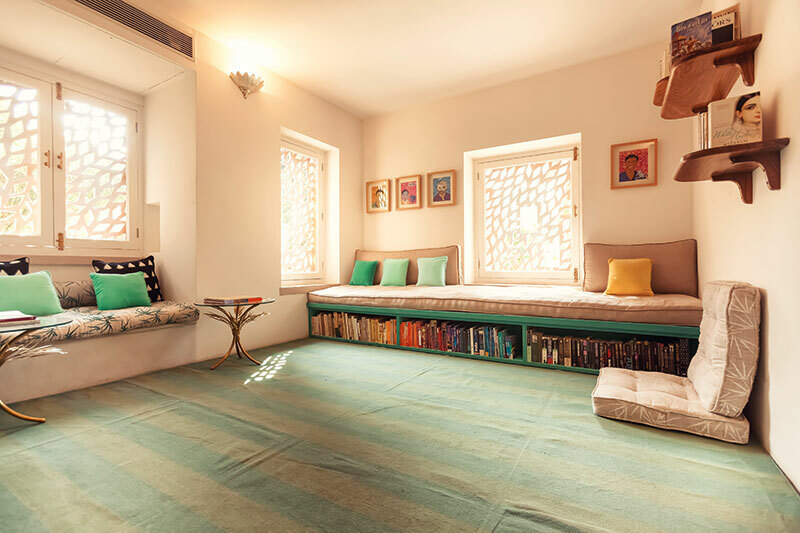 Its lush garden, reading nooks and well-stocked library make it the perfect intimate getaway that just happens to be located in the midst of the bustle of the Pink City. Healing Hands Sweat it out at yoga sessions on the terrace or in the midst of the verdant garden. Then cool down at the Kothi Spa run by Pahadi Local. The spa uses natural, organic products sourced from the foothills of the Himalayas, which are also available for purchase. 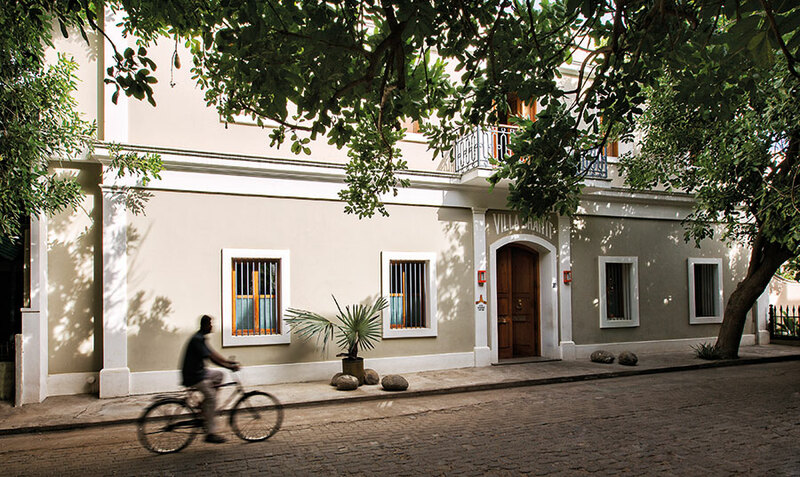 Set in Puducherry’s French Quarter, this hotel is hidden behind an unassuming grey facade. 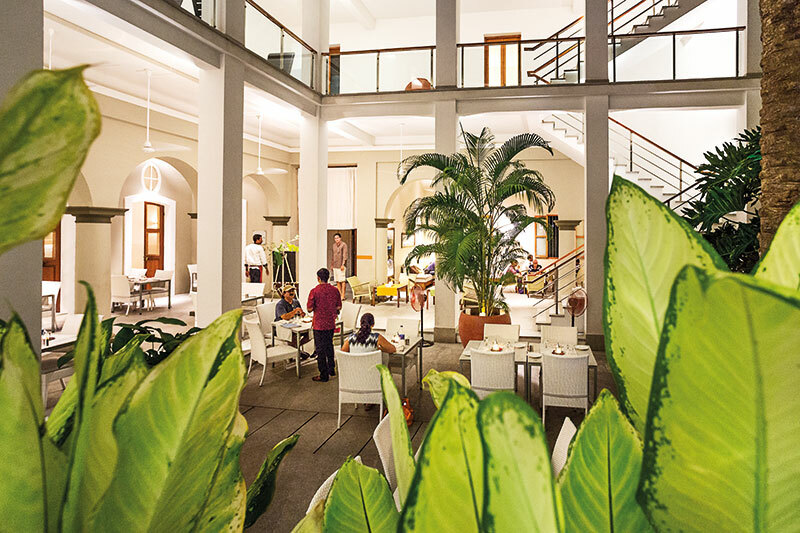 Set in a huge 19th-century building with a newly added wing, Villa Shanti’s aesthetic is a modern take on colonial architecture. Designed by French architects Tina Trigala and Yves Lesprit, the interiors are a delicate balance of Indo-Western sensibilities, with a distinct leaning towards kitsch. While their choice of materials is traditional, their usage is contemporary, thus giving the space a unique character. The rooms are built around an inner courtyard, which lets in plenty of sunlight and houses a vertical garden. The flooring in the suites is done using colourful tiles and red oxide, while checked lungis serve as curtains. 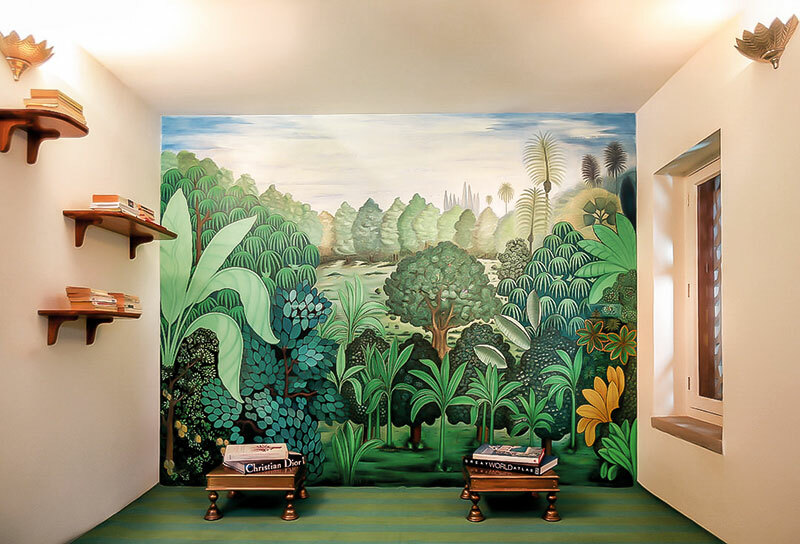 Bright, hand-painted murals and locally-made wood furniture dot the spaces, offsetting each other. The restaurant and cafe are both committed to using the freshest seasonal produce and serve a variety of cuisines including local street snacks. A special mix of French elegance and Tamil hospitality make this one of the coolest places from which to experience the culture of Puducherry. Lush Luxury For a more understated melange of the same design influences, visit Villa Shanti’s sister hotel, La Villa, located in the same quarter. Soak in the pool under the shade of leafy greens and enjoy a poolside breakfast before heading out for the day. Located off the banks of the Sabarmati River, the House of MG is set in a colonial-style mansion with two courtyards and many verandahs. Its design influences are varied and manage to seamlessly blend elements like a baroque facade, a 20th-century building, frothing fountains, stained-glass windows, Italian mosaic tiles, marble flooring and that most important of amenities — central air conditioning. The two wings of the hotel are named after two brothers — affluent businessmen who initially built the house as a family home in 1904 — MG (Mangaldas Girdhardas) and CG (Chamanlal Girdhardas). While the MG wing’s decor is inspired by old family portraits, the CG wing highlights traditional Gujarati textiles. 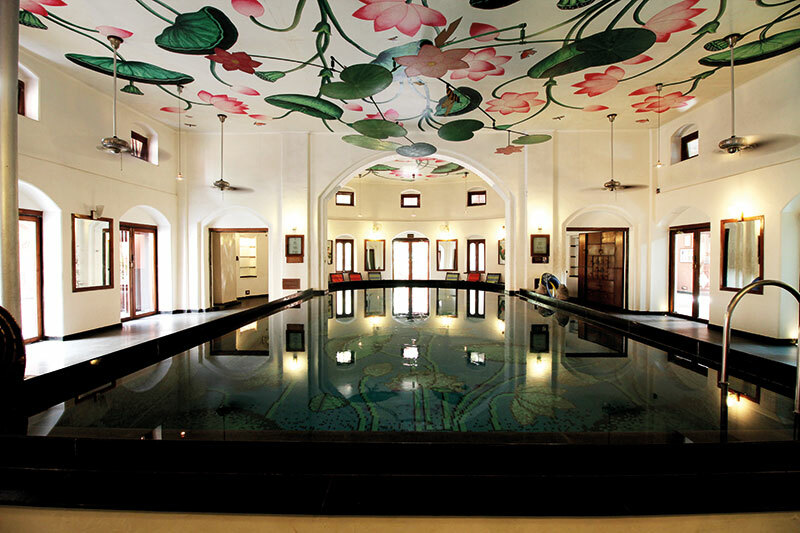 The property also houses an indoor pool and spa, as well as two restaurants that serve traditional Gujarati fare. An experience not to be missed is an authentic thali at the terrace restaurant called Agashiye. The spacious but sparsely decorated rooms with their high ceilings and modern fixtures, the history of the building, the friendly cats that might pass you by in corridors combined with the modern and up-to-date amenities create a unique and holistic ambience for the traveller to soak up a slice of Ahmedabad’s past. Treasured Souvenirs With multiple boutiques — from an antique and textiles store and gallery, to a heritage bookstore and a gift shop that sells artisanal products from across the country — you are guaranteed to find that perfect gift.